Is here to provide our Central Arkansas clients with a variety of entertainment for all types of events at affordable pricing. We have been serving local communities for over 25 years. We'll give you our best everytime, we hope there is absolutely no other reason to look anywhere else. Arkansas Entertainment Agency has all your entertainment and entertainers right here under one roof! Please take time to view our web site and see all of the great bands, wedding DJs, karaoke and other services we have to offer. If you have any questions about any of our Arkansas entertainers, we are here to help make your event a success. Thank you so much for visiting our web site! Arkansas Entertainment Agency possesses a comprehensive selection of disc jockeys and karaoke professionals for your wedding reception or perhaps an impressive corporate event party or holiday event. Our entertainment agency is established and located in Little Rock, Arkansas. We can also provide your event with a live band, string quartet, harpist, pianist, violinist, jazz band and numerous other exceptional Arkansas entertainers. Our goal is to provide Little Rock and surrounding suburbs in Central Arkansas the best entertainment there is to offer at very affordable pricing. 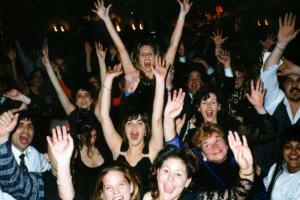 Such as if you would like to hire one of our professional DJs or bands for your wedding reception or party. Sure, we understand you can hire a band or DJ that performs at a local club or venue. But, considering you're wanting your event to be perfect, we insure all of our bands and DJs are pre-screened professional musicians and entertainers on our roster, that are experienced in a variety of social functions. Such as a wedding reception, corporate event, convention, or a high school prom, etc. Also, Arkansas entertainment agency offers the best Karaoke show in Central Arkansas and surrounding Arkansas cities. Karaoke is a great way to have your guest be the star at your event and it is an affordable alternative to a live band if your budget does not allow a band. Our karaoke DJs will keep the crowd dancing as your singers signup to sing their favorite hit songs. We would like to thank you for visiting our website and please check one of our availability checkers and receive an Instant FREE quote! Live Bands: Variety Dance Bands - Classic Rock - Cajun - Blues - Jazz - Swing - Retro - 70's Disco - Heavy Metal - Country - Raggae - Tribute. Specialty Musicians: String Quartets - Brass Quintets - Pianist - Violinist - Harpist - Guitarist (Classical / Traditional) - Bagpipes - Big Bands - Mariachi Band - Jazz Trios / Duos - Singers. Performers and Acts: Music Artist, Comedians, Impersonators, Clowns, Look a Like Celebrities, Hypnotist, Magicians. Our Agency offers the finest variety of live Musicians & Professional DJ's, Along with a diverse selection of Great Entertainment. We are one of the leading Central Arkansas entertainment agencies and our agency will do our best to provide our clients with the best entertainment in Central Arkansas and surrounding Cities. Please keep in mind our Central Arkansas DJs and bands travel Statewide. Cakes by Sam offers a wide variety of unique cake decorating supplies, silver cake stands, plateaus, fondant, gumpaste flowers, and many cake decorating tools. Downtown Little Rock Hotels Find downtown hotels in Little Rock ,Ar! "Your Entertainment Source For All Types Of Events"
Arkansas DJ | Arkansas DJs | Ar Bands | Arkansas Bands | Arkansas String Quartet | Little Rock Ar Band | Arkansas Wedding DJ | Mobile DJ Ar | Classic Rock Band Arkansas | Jazz Band Ar and this should help you when searching the search engines.